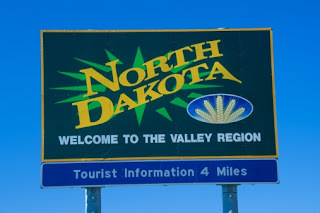 Here's a great article for all you hunters in North Dakota. I just shook my head when reading this, showing how truly stupid and ignorant some people are. It's getting to be that time of year again; the leaves are gone, the wind is getting stronger, and the air is getting colder. Fires (or electric base-board heaters) are roaring, and my roommate is starting to drink hot chocolate on a regular basis. Christmas music has even started playing in department stores, though it's a whole other column to go into how it's too soon for that. And, people are heading outdoors to shoot animals. Hunting is something I can't and won't understand. How can any self-respecting person venture out to the beautiful world of nature to destroy it? How does a civilized human being get their jollies from murder? It's beyond me, really it is. But let's say, for the sake of argument, that killing is something that you do enjoy. I'd like to lay down some "courtesy ground rules," if you will, that will keep this sad season at its most tolerable for those of us who prefer wildlife to be alive. 1. Don't boast loudly during class about the deer (bird, buffalo, kitten, baby, whatever) that you killed at some place that had this many points and weighed that many pounds. And definitely don't boast about how its head is now dripping blood in your garage, or mounted on your living room wall. I don't think that recent, senseless carnage is really a good topic for the classroom. 2. Don't wear your hunting gear to class. Are you going back out to the killing fields so soon that you can't even bother to stop at your house and change after your school day? On a Tuesday afternoon, I highly doubt it. That bright orange color is extremely offensive to the eyes, and wearing shirts that have grass and deer printed all over them is ironic only in a sadistic sense. For those of you who wore that kind of thing all the time to high school, so you keep doing it now, I say: you're in college now. You're supposed to be on your way to being a more educated, ethical person. And Grand Forks is bigger than your hometown of 100-3,000 people, and there are actually people here who'd prefer you keep your brutal habits to yourself. 3. If you have just come from an all-night spree of gunfire and beer, change your clothes before you show yourself in public. Having animal blood all over your pants is neither a fashion statement nor particularly healthy. 4. For those of you who do it for only for food, not sport, and to keep deer "off your car hood," fine; at least your intentions are honest. I don't like the beef industry, either; I'd much rather all animals have a free life before they become dinner. And I get that there are a lot of deer out there causing car accidents. But that's what happens when we destroy all their natural predators, stupid. That said, though, please pick the weakest of the herd, and make it a quick end. You think the deer of future generations are going to be able to get out of the way of your speeding vehicle any faster if you kill off their best genetic lines? You're really shooting yourself in the foot with that one, or rather, shooting your children and grandchildren in the foot. Also, all of the above rules still apply to you. In conclusion, try to keep your dirty habit to yourself. I don't want to hear about it, and I don't want to see it. You have not gained my respect for "conquering" the wilderness with your down jackets, thermal underwear and heat packs; nor will you ever gain my respect for taking the lives of animals that have no defense from you. Wow. How does an article like that even make the paper? Go to the website and look at the comments some people left. Typical UND student. Think they know more than the rest of the world. considering i have to put up with everyone else's stupid habits and hobbies, i really doubt i'm going to go out of my way to hide the fact that i hunt. hopefully this person is a communications major and not a journalism major. if so, i think the profession will take a serious hit if/when she gets a job. I'm guessing she's a vegetarian. In the last few years it's amazing how many vegetarians I've met. Just making an observation, there is nothing wrong with vegetarians. NDSportsFan wrote: I'm guessing she's a vegetarian. In the last few years it's amazing how many vegetarians I've met. Just making an observation, there is nothing wrong with vegetarians. a couple of years ago...eh...maybe 99 or 2000 there was a study that concluded a carrot produced a small level of electronic current when it was bitten just after being pulled from the ground. i can't remember where i read it, so basically i have no factual basis to back this up, but what the study concluded was the carrot was screaming in pain. so to me, that says that both vegetarians and those that are sane (we have pointed teeth...that means we eat meat so why deny what you were made to do?) are both consumers and are basically doing the same thing. Without the proteins found only in meat, red meat the human brain would not have developed to what it is today. Basically we would still be gathering nuts and berries and picking the bugs off of each other. That and those first six days that the big guy used before his day off. Can you say PETA Fanatic? First of all I will wear what I want to wear, wherever whenever I choose to do so, why should I not wear something just because some PETA freak tells me so? thundercat 99 wrote: Wow. How does an article like that even make the paper? and then the student paper runs an editorial defending her because she apparently has a right to express her opinion (but no one has the same right to criticize her opinion...again...apparently). ah to be back in college journalism again - where the mistakes are always super big and super ugly. on the plus side, next august maybe everyone will have forgotten about this one. on the other hand, it might be tragically awesome to keep tabs on this poor girl and see what kind of story she does as a follow up. i used to do that with Chuck Klosterman and now the freak is everywhere. always thought he'd end up writing obituaries in Wishek. turns out the guy makes it BIGTime. oh well....Chuck is still an idiot. Try reading Brad Tastads sports deal in the Traill County Tribune, uffda I sometimes wonder if he thinks before he writes . Wrote something about Stephen Argyle football team a few weeks ago having to do with the numbers they have go out (like 50) and I'm sure it had to do with they didn't belong in 9-man. The coach from Argyle must have gotten ahold of what he wrote and a few other SA alum because there were like 3 letters to the editor on what he wrote about it. I also remember him writing saying that Grand Valley shouldn't be division 2 because there enrollment is 20+ thousand stundents. just stupid. ndfan wrote: Try reading Brad Tastads sports deal in the Traill County Tribune, uffda I sometimes wonder if he thinks before he writes . Wrote something about Stephen Argyle football team a few weeks ago having to do with the numbers they have go out (like 50) and I'm sure it had to do with they didn't belong in 9-man. The coach from Argyle must have gotten ahold of what he wrote and a few other SA alum because there were like 3 letters to the editor on what he wrote about it. I also remember him writing saying that Grand Valley shouldn't be division 2 because there enrollment is 20+ thousand stundents. just stupid. thing is Chuckie K could buy the Trail County Tribune....but yeah...Bastad makes a guy wonder sometimes. Ok if she has a problem with hunting then whatever, but when the animals start getting disease from overpopulation then I want to hear what she has to say. My advice to her is probably to enter the real world sometime soon before she gets too far sucked into her fairytale dreams.